There’s a lot of irony in that title, isn’t there? Gladness and joy usually aren’t the terms we associate with the Vietnam Conflict. 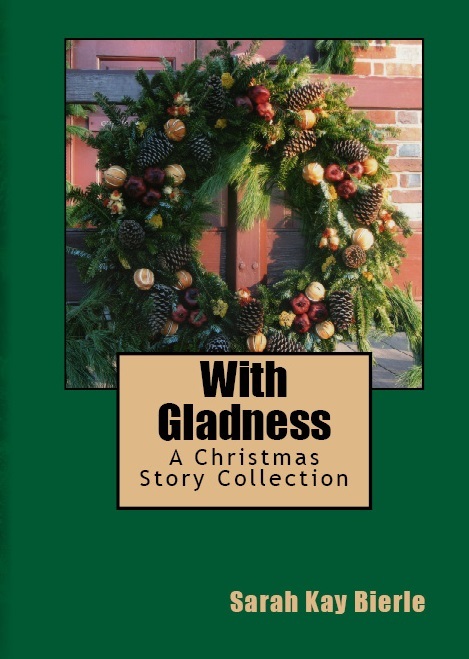 Why did I even put a story with that setting in the Christmas story collection? I try to write realistically in my historical fiction. That involves research (especially in the bigger novels where there are lots of details). It also involves avoiding the cliché – at least attempting. I didn’t start writing this blog post to justify my story plot choices. You’ll either like it or you’ll move on to the last story. This article will attempt to share some history on the Vietnam Conflict. Believe me, it’s a topic that can’t be fully covered even in a 500 page non-fiction book, but we’ll try to let our simplified 800 word blog post give you a little more insight to the setting of the short story. It’s not technically called a war…because America didn’t officially declare war. The Gulf of Tonkin Resolution gave President Johnson the power to escalate U.S. involvement, without official declaration of war by Congress. Thus, it’s properly called the Vietnam Conflict. The dates are fuzzy too. Why? Because there’s the French period and the American period. The French pulled out of the Indochina Wars around 1954, and the American period of the Vietnam conflict is generally placed between 1955 and 1975. Why did the U.S. get involved? It was the Cold War era. Previous resolutions had declared an American stand against communism throughout the world and a promise to aid nations threatened by communism. South Vietnam was threatened; American came to their aid. A noble plan, but South Vietnam had a lot of government and military problems, making it difficult to fight the conflict and have clear objectives. Moral dilemmas, bombing and chemical warfare, and feelings of little support from home created morale issues and conflicts among the U.S. military. How did it end? 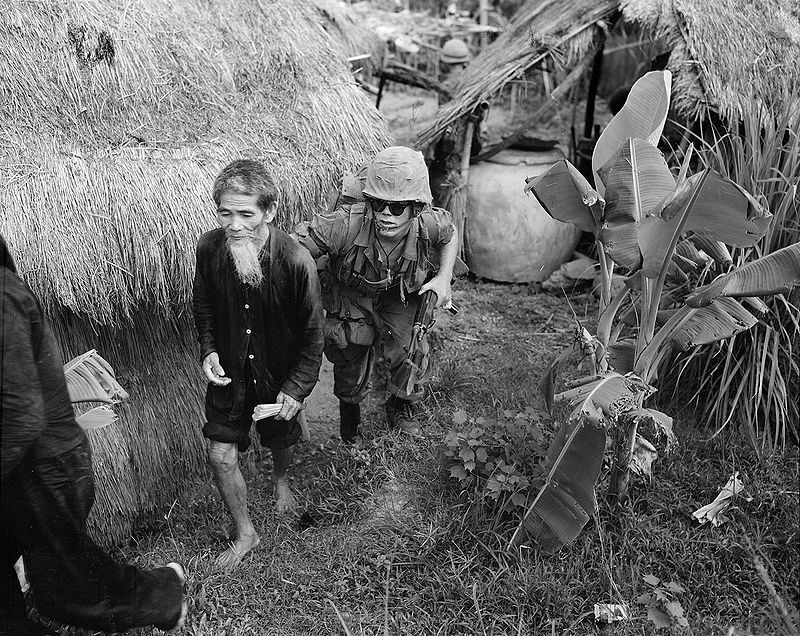 U.S. troops started pulling out, letting the Vietnamese fight their own war. That didn’t work so well. South Vietnam fell to Communism in 1975. A U.S. Marine moves a captured Vietcong suspect. Friend or foe? The terrain and climate of Vietnam is not forgiving. It is excellent for defensive war. Communist North Vietnamese infiltrated the jungles, setting up an elaborate network of guerrilla warfare. Historically speaking, guerilla warfare is one of the hardest tactics to defeat. It becomes a game of cat and mouse and it’s hard to know if you’re on the offensive or defensive side. Villages were recruited by the Vietcong to fight against the Americans and South Vietnamese – without uniforms or other identification it became hard to know who was a friend and who was enemy. There were large scale battles during the conflict, but the story’s setting focuses on the jungle patrols and guerilla warfare. History books tend to focus on the draft riots and conflict protests of the Vietnam era on the American homefront. While there is much to consider in these incidents, I find it tragic that we don’t hear more about the families who supported their soldiers, and the many individuals who volunteered to serve their country. This is something I’ve tried to hint toward in the An Unbroken Circle. The main character receives “life-line” letters from home and know that his family supports him. He doesn’t think about the protests because he doesn’t want to know. He folded the letter and slipped it in his pack. Diane cheerily wished him a Merry Christmas. He’d almost forgotten about the holiday. Days ran together endlessly here. He closed his eyes, trying to imagine her happy smile and the way she sang carols in her high, out-of-key voice. Home was thousands of miles away, and, with the promised patrol, it seemed the only Christmas he’d get this year was what he chose to remember. There wouldn’t even be the opportunity to celebrate in camp. Hours later, they were tramping through the countryside. Sergeant Jones marched in front of him, his rifle at the ready and his helmeted head turning slowly as he scanned the area. Frank gripped his weapon and shrugged slightly, trying to ease the weight of his pack; intently, he listened and watched, fully expecting enemy gunfire at any moment. Behind him, his buddy Rich Patterson – nicknamed “Scruffy” – trudged, panting and whispering “blast it!” every time he stepped in a muddy patch. The other soldiers spread out behind, all alert.